Historic Franklin TN is the definition of a traditional, small Southern town. As a matter of fact, it has been recognized as one of America's Top 10 Small Towns. Founded in 1799 and named after Ben Franklin, the town is checkered with American artifacts from the Civil War monument erected in the downtown square to the water tower hovering over what once was a stove manufacturer, that locals know as The Factory. Historic Franklin is just 16 blocks and is surrounded with homes that date back to the 1800's. In 1975, Franklin was added to the National Register of Historic Places. It's the kind of place you only see in movies; from the antique malls to the Art Deco movie theater dating back to 1937. Franklin values its history. 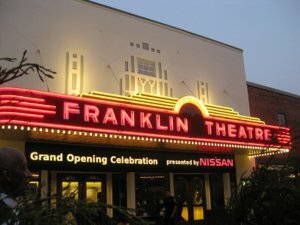 There is no better example than the resurrection of the Franklin Theatre. Like many of these small town theaters, it had fallen into disrepair and become an eyesore to the community. After being out of business for several years, the Heritage Foundation of Franklin bought the building and completed an $8M dollar renovation. It now seats 300 patrons and hosts special events, screens classic films and books local talent such as Sheryl Crow. Restaurants and unique boutiques line the streets of historic Franklin. It's a vibrant downtown that attracts visitors from all over the country. Many people are tempted to move here after spending an evening at Puckett's Grocery & Restaurant. Where macaroni and cheese is listed as a vegetable. Wander into Merridee's Breadbasket any morning of the week and chances are every table is taken. The smell of fresh baked goods wafting in the air. The big barn timbers and country baskets hanging from the ceiling just add to the ambiance. Franklin is the county seat of Williamson County government. While the historic courthouse still stands on the square, a new modern courthouse is just around the corner. There's an interesting mix of old and new here. You will find Starbucks located on the corner of Fifth and Main and just doors away Frothy Monkey located in an old historic home. Both coffee purveyors reminding us of the new and the old that makes Franklin so unique. Several festivals are offered throughout the year to bring residents to historic Franklin for good music and food. Events include the Bluegrass Festival, Pumpkinfest, Wine Down Main and Dickens of a Christmas. Homes range from historic homes built in the late 1800's through the 1950's to the new construction homes such as Benelli Park. These are just a few of the reasons, buyers decide to make historic Franklin TN their home. 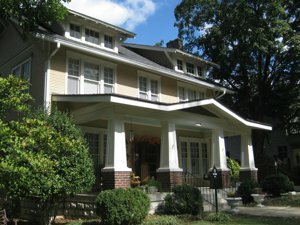 Below you'll find a complete list of the historic Franklin TN homes for sale. Generally speaking homes that fall within a mile of the Franklin Public Square will be listed in Historic Franklin. Visit our historic, downtown Franklin new construction page for new construction only. Let us help you find your next Franklin home. Charming condo in HEART OF FRANKLIN! !